So I have already made my first cookie for raya on Friday. I made it after Babycakes has gone to sleep so I can bake in peace. I ended up sleeping at almost 3am! And of course I woke hubby up for an early sahur of bubur lambuk which I took from Masjid Wilayah earlier that day. 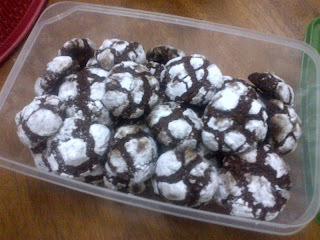 My first cookie is Chocolate Crinkle Cookies, the recipe which can be googled. The ingredients are very minimal but it takes quite some time to make as you first need to refrigerate the cookie dough for about an hour or more before you shape them in tiny balls. After that, roll the balls in icing sugar before placing them on a baking tray lined with parchment paper. The first batch I made, the cookies turned out huge as I did not know how to gauge the size. The recipe calls for the use of baking powder so naturally the cookie will rise and expand. So the subsequent batches were made smaller and make sure you spread them evenly or they'll stick together, like what happened to my first batch. I did not take any pictures of the cookie in progress as my hands were messy from rolling the dough into tiny balls. It has to be cold so you have to work quickly as the dough will get soft due to the warmth of your hands. While one tray is baking, I refrigerate the remaining dough until it is ready to be baked. This process was repeated several times as I can only bake one tray at one time, thus taking a lot of time to finish baking the whole dough. The end product. It tastes very chocolatey and sweet. 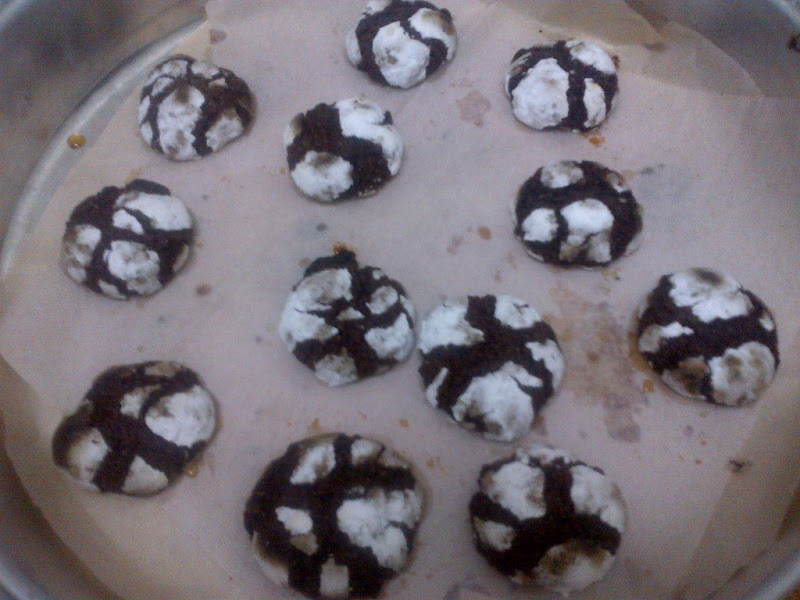 It sure looks pretty too with the contrasting colours of chocolate and white.